I've been catching up with my theatergoing at a tremendous rate lately. Last weekend, I caught "The Jazz Age" at the Blank, which featured the fabulous Jeremy Gabriel as Ernest Hemingway, and "Who's Afraid of Virginia Woolf?" at the Rubicon, featuring the also fabulous Joe Spano. "Who's Afraid of Virginia Woolf?" is a tremendous play by Mr. Edward Albee. And the Rubicon, which is way the heck out in Ventura, did a tremendous job staging it. Julie Briggs and I did a Sunday road trip to see their final matinee performance, and I was so glad we did! We'd previously visited the Rubicon to see Joe Spano in a one-man show about Buckminster Fuller. It was fabulous, too! Joe Spano was in "Hill Street Blues" a long time ago, and occasionally guest-stars nowadays on NCIS. But on stage you can really see him shine. Playing George, an actor has to be just right -- smashed down by life and wife, but ultimately as strong and brutal as she is. Their Martha was amazing -- a whiskey-soaked voice and earthy sexuality and brutality was matched only by her vulnerability at just the right moments. The young couple were perfect. But it's always hard to remember to mention them when you see a good George and Martha -- everything else pales in comparison to their relationship. All four were smart actors, the language was sublime (oh, Mr. Albee! ), the set was beautifully details and functional. I stood up to cheer the play and performance afterward, and I'm not one drawn to my feet at the drop of a hat. Labels: Jeremy Gabriel, Joe Spano, Rubicon Theater, The Jazz Age, Who's Afraid of Virginia Woolf? Stephen Fry and Hugh Laurie (aka House) are a crack up. I recently netflixed their show "A Bit of Fry and Laurie" -- a variety show they did back in the day -- and loved it. It's like Saturday Night Live (the skits) or Monty Python -- skit after skit, with a few song and dance numbers thrown in, and an occasional guest. But mostly it's the two of them, getting silly. Part of the reason I checked out the show, and also some Monty Python, is that I've been toying with the idea of writing some sort of comic variety show for the stage, to punctuate my interminable darkness. We'll see. I have ideas coming out my ears right now, and not enough hours in the day. But I could do worse than to mess around with a bit of comedy with these fellows as a guide... They're fearless. That's the key. One should always be fearless when you're writing. Leonard Cohen is on the road again. I wish I could see him perform. I like his music a LOT. Mr. Cohen is a singer-songwriter, a contemporary (and sometime lover) of Janis Joplin amongst other people, an observant Jew who simultaneously practices Zen Buddhism, a poet... He writes songs that are so filled with yearning, for both sexual and spiritual fulfillment, that they kick me in all my deepest places whenever I hear them. Favorites include Chelsea Hotel #2 and Hallelujah (particularly as covered by young Rufus Wainwright, Mr. Cohen's fellow Canadian songman). It's not the same as seeing Mr. Cohen himself... but on Friday, I'm heading over to Scripps College to hear "Book of Longing," an evening-length concert work composed by Philip Glass, based on the poetry and artwork of Leonard Cohen. It promises to be a terrible drive, but a cool experience. I shall report back. Interesting article here on the consequences of sleep deprivation to our mental health. I *am* sleeping better now that I have a proper bed, though. Six years on a pull-out couch was killing me. I loved Man of La Mancha. The Reprise production at UCLA had some issues, I thought -- principally their Dulcinea -- but I loved it anyway. I was talking with my brother the other night on the phone about it, and I could see him rolling his eyes at me, right through long distance. Man of La Mancha??? There are several reasons why that musical punches my buttons. 1. The songs are glorious and singable and mostly in my warbling range. 2. It's about a writer who is telling a good story. 3. It has romantical notions about how to frame your own life story, and why that's so important in a world in which we don't have control over so many things. 4. I bought the soundtrack on tape when I was a nanny and housekeeper in Connecticut, and listened to it over and over again -- I had about three tapes all together. One of them was whalesong. Another was rain. So basically it *was* my music for one entire, lonely year. There's another reason I like it too, though. It has multiple levels of time and action happening simultaneously. On level one, writer Miguel de Cervantes is in prison, awaiting a probable death sentence from the Inquisition and telling a story to entertain the other inmates in a desperate attempt to keep them from burning his manuscript. On the second level is the story of old Don Quinones, who is widowed and alone and sad, and has a money grubbing family who are embarrassed by him when he goes mad. On the third level, is Don Quixote -- the character that Don Quinones becomes in his madness -- who has the power to transform shaving bowls into golden helmets, windmills into giants to be bested, and a prostitute into the Lady Dulcinea. Don Quixote tranforms more than these objects, though -- he transforms the people in Don Quinones' world. He transforms the people in Cervantes' world. He give the audience new eyes to see their own world. The Prince of Tides, by Pat Conroy, is a favorite book of mine, and it does a beautiful job of wending us through the present day story of Tom Wingo dealing with his troubled twin sister's suicide attempt and the various threads of their childhood that have made them and their brother the people they are. Also, the narrative voice is absolutely gorgeous. It, by Stephen King, is my favorite book by him (and I've read a bunch). A group of adults are brought back together when a Great Evil they defeated as children returns to the town where they grew up. I love the weaving back and forth through time and perspective in this book. We see the two action lines -- fighting the Great Evil in the present and fighting it in the past. But we also slide in and out of each of the character's heads, in the past and in the present. We see who they are now, and who they were then. What they share with each other, and what they keep secret, and the secrets they understand about each other even when they are unspoken. What a glorious world, where all these stories are ours to read and see and love and learn from!! The weekend didn't seem promising at the start. But it ended up being pretty darn good, all around. Friday began with procrastination. I usually try to spend some good, solid time on Friday afternoons and evenings, finishing (or writing) pages for my Saturday morning workshop. Last Friday, though, I did anything *but*. I returned e-mails, I checked FaceBook, I made a to-do list, I organized my knapsack. I decided that maybe I was too stuck on the play I'm working on, so I should bring in pages of something else, and started typing those in from my long-hand notes. It wasn't very satisfying, though. I keep thinking about this play. At about 7pm, I left the office and went over to Hollywood Forever Cemetery to see Three Sisters, featuring the fabulous Aileen Cho (who played Khim's sister in Song of Extinction) as Irina. Heidi Helen Davis (who directed Song) joined me. Wonderful play. Beautiful, beautiful, beautiful heaps of subtext under a surface story with just the right amount of action. Oh, Moscow! I was longing for it myself by the time the story ended, and crying for the three sisters who had found themselves mired very far away from where they wanted to be. We met up with Trey Nichols (who played Gill in Song) there, who happened to be reading Huckleberry Finn... A great night. The play was actually performed in an old, restored Masonic Lodge hall on the cemetery premises. Excellent cast and use of the space. On the way home, I thought about my play. And thought about my play. But when I got home, I exercised. "I'll exercise first," I thought to myself. I lied to myself. It was 11:30pm... Then it was 2pm. There had been exercising and a snack and a check of the e-mail, but there had not been writing. So I set the clock for 6am. Maybe I would write then. I got up at 7am. And I rewrote the first three pages of my play. And by the "first three pages," I mean the Character/Setting page, plus the first two pages. It took me so long that I was half an hour late to workshop, but... I wasn't sorry. I was sorry for my rudeness to the others in workshop, but I was so happy to have rewritten the beginning of my play! When we read my three measly little pages, it felt like a rebirth... a necessary change in the trajectory. Because you have to get the beginning right. If you don't start out right, how can you *go* right? I had been withholding things from the audience with the beginning I had before. Why? GIVE IT ALL!!! GIVE MORE!!! I don't know if I'll ever finish this play. I hope I will. But I feel like I'm at least in the ballpark, now. I should tape Mr. Albee's notes up above my computer, so I don't forget. Back to the long weekend's activities. I saw Battle Hymn, produced by Circle X at [Inside] the Ford, on Sunday afternoon. Interesting play. I had some not-insignificant quibbles, but it was well-worth seeing -- amazing acting and an *incredible* use of the space. Beautiful, beautiful. Inspiring. I was supposed to do a War Plays Project event after the matinee, which didn't happen... which is a whole other story. But anyway! Good play. To round out the weekend, I received an e-mail from the folks at the Ecodrama Festival, which is going to be held at University of Oregon in Eugene in May. Song of Extinction was selected to be the winner of the playwriting competition! So I guess I get to go out there and play. I am delighted. Not only is it an honor, it's in my beloved home state of Oregon, which I'm always glad to go back to. Tonight, I'm headed over to UCLA to see Man of La Mancha (Reprise at Freud Playhouse). Dream the impossible dream, people. Be bold. Keep writing. I've read and seen the film of The Laramie Project, but this was the first time I'd seen it staged. It is such a powerful play. It's about what happened to Matthew Shepard, a gay man who was murdered in Wyoming. But it's also, more fundamentally, about people struggling with their identity in the wake of an event that challenges their perceptions of themselves. Who are we, that this could happen here? A very, very good question. Pippin didn't really do that much for me. I appreciated it -- Deaf West did a great job at integrating the signing and singing in the musical, and at selecting a play that could have relevance to the deaf community, when looked at from this angle. But ultimately, I didn't particularly like the music, thought the stage was very empty-feeling for a musical, and didn't care about young Prince Pippin's quest for identity and meaning. Maybe if I hadn't just seen The Laramie Project, Pippin would have felt less like navel-gazing to me... On another note, what did they do to the Taper??? I LOVED this venue before the renovation. It felt so intimate, and the stage so close. Now -- not so much. And I'd heard people talk about the acoustics being worse -- I definitely think they are. A musical should fill the room with sound. Even with the actors miked, the Taper wasn't filled with sound on Saturday afternoon... On the upside, though, the two actors playing Pippin were both fabulous. I wanted to keep watching them, just in a different play. Fata Morgana was interesting. My friend -- playwright and actor Tony Pasqualini -- was in it, which drew me there. It's an old Hungarian play about a sincere young man who falls in love, for the first time, with his... ahem... experienced older cousin from the city. They have one wonderful night together, then his family and her husband all arrive at the family home -- and he tells them all that she's going to divorce her husband and marry him. It's kind of a coming of age comic tragedy, tragic comedy... Three acts, great costumes, and a sad empathy for the young man who is learning for the first time that the world isn't a simple place and love doesn't conquer all. I went to Laramie alone, but with Michael and Stephanie to Pippin -- so fun hanging out with them and talking theater and life and everything after! At Fata Morgana, I ran into Bennet Cohon and his wife, and it was great talking with them. Sounds like he's going to be involved with putting up some more one-acts at Write Act this summer (he produced my play The Edge of Ross Island there in the fall). I also ran into a gal who had directed a reading of Catch for me in an ALAP reading ages ago. I really, really have to do the revisions on that play and start sending it out. It is TIME. In other news, I went to workshop (without pages, bad playwright) and am still dealing with a gas leak under my apartment (argh!!). Busy weekend! I still had time to watch a few episodes of Criminal Minds, though. Oh, cop shows! I can't get enough of your angsty grappling with good and evil. The Los Angeles Drama Critics Circle has announced its nominations and special awards for excellence in Los Angeles and Orange County theatre for the year 2008. The show will be hosted by Vicki Lewis (TV's NewsRadio and Ovation award winner for Hotel C'est L'Amour), who will be joined by LADCC Awards co-host, critic Wenzel Jones. The honorees are selected by the 16 members of the LADCC, who write for newspapers, magazines, trade papers and theater websites (two freelance reviewers for Los Angeles Times are members). The group is "dedicated to excellence in theatrical criticism and to the encouragement and improvement of theatre in Greater Los Angeles." The Ted Schmitt Award for the world premiere of an outstanding new play will be awarded to EM Lewis for Song of Extinction. The award is accompanied by an offer to publish and a $1,000 check funded by Samuel French, Inc. The 40th Annual Los Angeles Drama Critics Circle Awards ceremony will take place on Monday, March 16 at the El Portal Theatre, 5269 Lankershim Blvd in North Hollywood. Tickets are $40; $5 off if purchased in advance via PayPal. The doors open at 6:30 p.m. for a catered reception (with no-host bar) and silent auction. The show commences at 7:30 p.m. Tickets to the Awards show can be reserved from the LADCC's website. Song of Extinction is also a nominee for two LA Weekly Awards -- Best Production, and Best Lead Male Actor (Darrell Kunitomi, who played Khim Phan). Very cool! Must keep writing. Trouble focusing lately. I have many, many things to do, and find myself... not doing them. I'm not even focused enough to write a "to-do" list of the things I'm not doing. What is this new year's lethargy about? I did nothing but sleep over the holidays. And I've not been too busy since. Got to get it into gear in the new year!!! Spent the weekend in San Diego with Aunt Lori and Uncle Harold, and my brother Jason, who is driving across the country from his old home in Washington, DC to his new home in Washington State. We had lots of fun. 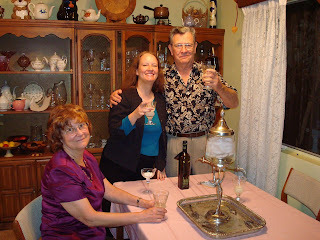 One fun thing we did was try out absinthe, which is now legal (you'll be glad to know), but that I'd never tried before. Made me feel like Hemingway. Has a licorice taste to it, and it's very strong. Hail, the green fairy! Joe was very glad when I got home, and told me never to leave again. 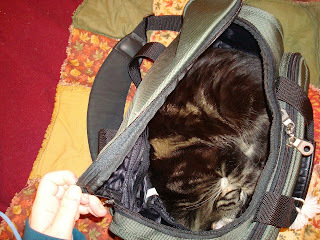 He got right into my overnight bag as a preventative measure.